Did you know that the original 3 Musketeers candy bars came in packs of three? Neither did I! My youngest son told me that little piece of trivia the other day. 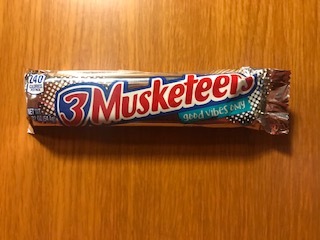 Since it was fascinating to me, I decided to do a little research and find out what the history of the 3 Musketeers candy bar was and share that history with you. Mars, Incorporated introduced 3 Musketeers in 1932. It came in a box and had three mini candy bars in it. One was strawberry, one was chocolate and one was vanilla. Their marketing department advertised it as a candy bar so big it could be shared with two friends. I guess that’s true if you can find two friends who like vanilla and strawberry candy bars. No one is going to share the chocolate one! An interesting fact is they stopped producing the strawberry and vanilla versions in 1945. Rationing of sugar began during the war in 1942 and it became too expensive to continue producing all three flavors. Since chocolate was the favorite by popular demand, Mars only continued to produce the chocolate flavor. There have been other flavors of 3 Musketeers over the years in limited editions, such as mint, French vanilla, mocha cappuccino, cherry, raspberry and orange, but the chocolate version is the only one you see today. Since everything is shrinking, I’m pretty sure the size of today’s 3 Musketeers is barely larger than the original mini size. Back then, you paid a whopping 5 cents for all three candy bars. Today’s prices are closer to a dollar for just one. But, as a bonus, there is less fat in 3 Musketeers than other candy bars – only 7 grams! I say that’s a win-win because if you count fat grams and want a treat, you can never go wrong with chocolate covered nougat!